Want to make your next event truly memorable? Invite Jake the Lion to make an appearance! Jake will visit your event based on availability for a one hour interval. 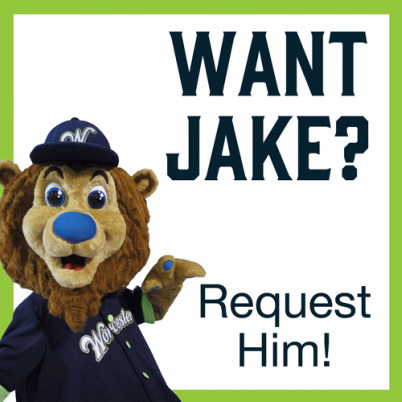 For most appearances, Jake will be accompanied by a Worcester Bravehearts' staff member who will hand out prizes and schedules, take photos, and entertain crowds along with Jake. We encourage you to make your request as early as possible since requests will be filled on a first come, first served basis. Mascot appearances are limited to 60 minutes in length in order to accommodate multiple events on the same day. Longer periods of time may be considered in unique situations. The mascot will need a secure changing area with a locked door. Please make sure this area is away from attendees, well-lit, and able to be used for storage while the mascot is in costume. The mascot fee is $60, which includes tickets to an upcoming game (see form below). The fee is payable in advance by check made out to the Worcester Bravehearts or by credit card by calling 508-438-3773. Once the request is received, a member of the Worcester Bravehearts staff will contact you to arrange for payment and coordinate final details of your event. Tickets included in your appearance will be delivered at your event.